From a handful of people who were the founding fathers of IPUA in 1992, today it is a 300 strong member community, comprising of leading multinationals, Medium & small scale sector companies, employing approximately 180000 people directly & indirectly, with an annual turnover of over US$ 2 billion with an enormous potential still untapped. The Association is an organized and purposeful movement with a clear road map to amalgamate the various non PUR stake holders to drive a common goal of industry standardization. The Association was formed in 1992. It has been responsible for bringing together a heterogeneous group consisting of raw material manufacturers, machinery manufacturers, Processors, Molders, laboratories etc under the banner of Indian Polyurethane Association (IPUA). The Association comprises of members of all sizes global and domestic. It works together for the development of the industry. The association is Technology Neutral, Product Neutral, Process Neutral and Company Neutral. IPUA s achievements over the years? IPUA has over a period of time evolved as a voice of the Industry and is an active member in the Associations Group of CII. Opinions are sought on core economic & fiscal policies of the Government and its implications to the industry at large. 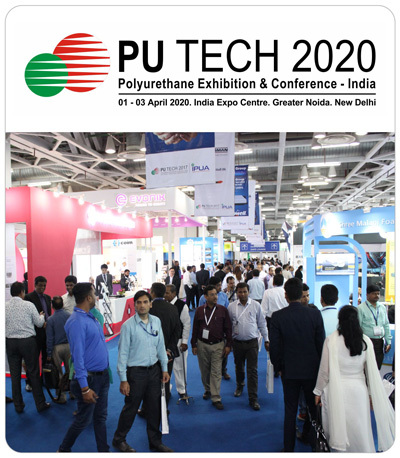 The greatest achievement is in successfully conducting international exhibitions PUTECH India every three years since 2005. IPUA has in collaboration with Ministry of Environment Forest & Climate Change worked out a strategy to phase out the Ozone depleting substance of Hydro chlorofluorocarbon(HCFC) in a time bound manner in the interest of the environment and the industry. The India Insulation Forum was launched in 2013 with the support of Bureau of Energy Efficiency to consolidate and strengthen the insulation implementation in building sector. It conducts programs for awareness, applicator training and lobbying with the government. IPUA has created the Virtual Technical Center in collaboration with Venture Center and NCL in Pune in 2016. This has become the hub for its training programs for its members on various sub segments. It also offers expertise and development support. The Spray Foam Alliance of India was simultaneously launched in 2016 to promote the safe usages of spray polyurethane foam in the building insulation. Formation of PU TECH and the background behind it. Though the PU industry was born in India in the late 60’s, it was only in the 90’s that an attempt was made to showcase the opportunities and highlights of the industry. So after a major seminar in Pune in 2000, the first PU TECH was launched in 2005 in Delhi. Ever since every three years this is growing in size and appreciation. The main objectives of the IPUA are to increase applications using polyurethane and make the industry technologically savvy and socially relevant.